I’ve been eating totally vegan & mostly raw for the last few days. I have to say I am loving it! I start my day with a raw fruit, hemp protein, & almond milk smoothie, then eat a beautiful raw salad for lunch, & for dinner some lightly steamed veggies & protein (tofu or Gardein). I feel amazing & my skin continues to be clear & aglow! I have a huge amount of beets on hand, & while I’ve been shredding them raw in the food processor to put on salads, I still have so many that need to be utilized. I also have several large turnips, & my favorite way to enjoy both of these root veggies are roasted! Roasting definitely goes beyond the 116 degree mark, but I never said I was aiming for 100% raw! 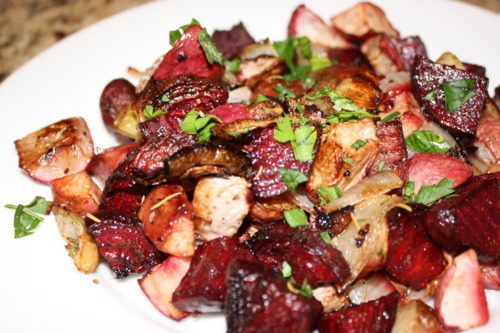 Place beets, turnips, onion, & garlic on a lightly oiled platter. Toss with olive oil, balsamic, rosemary, & salt & pepper. Roast at 400 degrees for about 1 hour or until edges are crispy. Top with chopped fresh parsley.